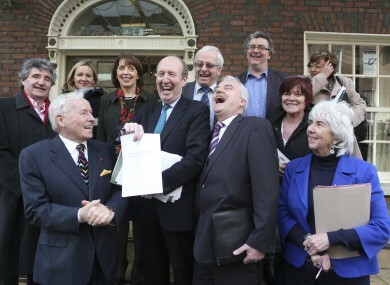 Some of the independent TDs involved in the loose alliance at a press event in Dublin yesterday. A GROUP OF independent TDs are offering what they say is a “support system” for candidates running in the local elections in May – but talk of a new political party has been downplayed. Though the establishment of a new party has not been ruled out entirely, the main aim of at least six TDs is to establish a network for people considering running in the local elections on 23 May to access advice on logistics, such as how to get posters printed. Independent TDs Catherine Murphy, John Halligan and Thomas Pringle have produced a working document entitled ‘Independent Thought – United Vision’ which sets out a proposal to “work together for the improvement of society with a vision of making the State more responsive to the needs of citizens”. Former junior health minister Roisin Shortall, ex-Labour TD Patrick Nulty, and independent deputy Finian McGrath are also involved. McGrath said that local election candidates will be required to sign up to the document which is published for by TheJournal.ie for the first time today. The working document, which may be subject to change, outlines areas where it is envisioned the loose alliance of independent TDs and local election candidates can cooperate on issues such as equality, personal debt, human rights, community and local government. “A lot of us have been working with and mentoring independent people who are looking to contest the local elections and instead of doing that individually we thought there would be a basis for doing it collectively,” Murphy said at a press event on a separate issue in Dublin yesterday. “Essentially we’re looking at some practical measures, people are asking us very practical things. Other TDs who are thought to be involved in the project include Dublin-based deputies Tommy Broughan and Maureen O’Sullivan as well as Wicklow TD Stephen Donnelly. High-profile independent TD Shane Ross could also become involved. As this website reported on Tuesday, Ross has been canvassing the views of some of his closest advisors on whether the time and mood is right for a new political movement. Email “TDs will provide 'support system' for election candidates - but insist they're not a party”. Feedback on “TDs will provide 'support system' for election candidates - but insist they're not a party”.